The Mind Robber is Doctor Who at its most inventive. Its combination of fictional characters, predominantly from 18th and 19th century literature and fairytales, with traditional SF elements creates a unique feel that is definitely more fantasy-oriented than the show would achieve again for several years. The fact that it manages to pull off its often grand vision is a real testament to the skills of everyone concerned. These five short episodes [part five barely manages to make 18 minutes] are Doctor Who at its most intelligent. Once again the episodes have been lovingly restored, although part one still shows signs of its age. Large parts of the action in the white void suffer from fringing around areas of high contrast, although this is a minor detail when compared to the previous VHS release which was shot through with dirt, dust and scratches. The audio has also been spruced up nicely. The disc contains two documentaries. The Fact of Fiction looks at the making of the story and is shot largely against a white void - a nice touch. Highlander, a look at the character of Jamie McCrimmon, is less visually interesting, although Frazer Hines' bleached hair is very striking. Both, however, are strong on content which will please fans. Add the Basil Brush sketch with the Yeti, a large photo gallery, a commentary [mainly dull and disappointing] and some top notch production notes and it all adds up, once again, to a first class release. Even the Easter Egg's okay-ish! 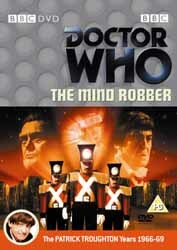 I would recommend The Mind Robber to anyone - it's simply great TV.